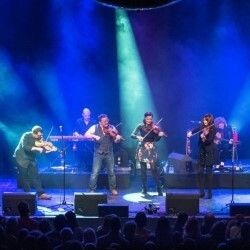 Scotland’s most celebrated fiddle band Blazin’ Fiddles will be joined by the twice-voted Scots Singer of the Year and two-time BBC Radio 2 Folk Award nominee Emily Smith for a special one-off Scottish tour. Each member of Blazin’ Fiddles draws upon the distinct flavour of music from their part of the Highlands and Islands. Blending solo and ensemble sets, with the occasional insightful tale, they come together in a fiery blend to excite your senses. Fiddlers Jenna Reid, Bruce MacGregor, Rua Macmillan, Kristan Harvey are joined by Anna Massie on guitar/fiddle and Angus Lyon on piano.